Description: Where the Black Mountains pierce the sky, they divide the south from the north, Alamir from the kingdom of Belenus. Belenus, the undying master of the north, commanded Keiran – the Captain of the Hosts – to conquer Alamir. But the Captain is deep in conspiracy, and he has his own plans. I shy away from reading fantasy, much less endorsing it. However, when Shannon asked me to endorse her newest book, I told her I would give it a try. I am so glad I have this excellent book a change and I hope you will to. Although it can best be classified as fantasy, it does not have the magic and overwhelming darkness that normally comes with the genre. Like Shannon’s other books, she is reclaiming some of the genre’s that are dominated by secular fiction. This is a tale of strong male friendships that are not girlified. This is a story of a people’s struggle for freedom and survival. This is a story of personal redemption. 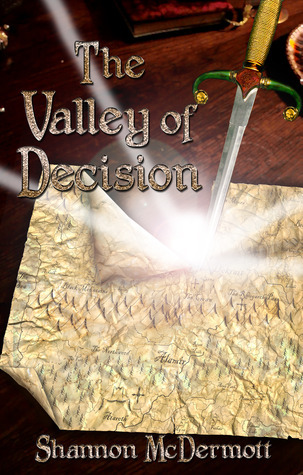 Valley of Decision it a light allegory of our own lives and struggles. The characters in this were so well developed. Each had their own personality and way of thinking. In fact, I don’t think I have read a female author who has done such a good job of making two good male leads so different. The world that Shannon created for this story felt very real. Some fantasy just doesn’t work well because the author didn’t take enough time to world build. Shannon obviously did a lot of work and created a place that feels real. For those of you who get tired of romance stories, this book also proves to be a nice break from the norm. There are a couple of very minor romantic interests in the story (one of them being a married couple) but that is it. I highly recommend this book to those who like well written fiction, non-magical fantasy, and stories that inspire.